Before today I had no real idea what Hunanese food was, or how it differed from Sichuan. Sure, I have the Fuschia Dunlop’s cookbook. But following recipes for a cuisine I’ve never tried is not the way to experience it. After Ba Shan though, my response to Hunanese has gone from “Huh?” to “Hell yeah!”. From the first mouthful of preserved duck eggs and salted (I think) chillies, all creamy, subtle and darkly translucent “whites” covered with vivid fire-engine red chilli I knew this would be interesting. And the fascination just grew, right through to the despairing lift of my chopsticks as i tried to cram in one, last piece of tofu. This food was very good indeed. Just as firey as Chilli Cool’s sichuan specialities, but more pungent and sharp than numbing and fierce. 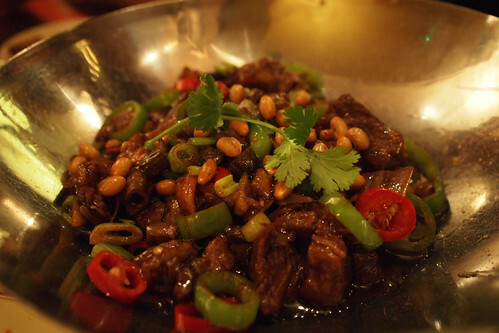 This is because Hunan, as well as worshipping the chilli, loves everything pickled and preserved, dried and salted. 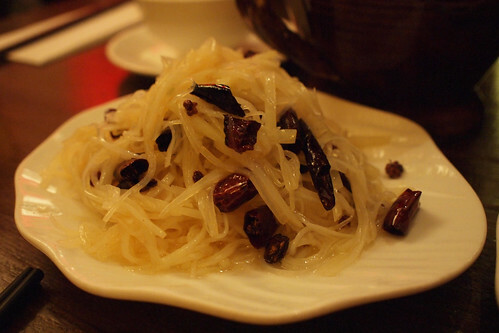 Dried radish with Chinese bacon was a classic example. Fine slices of pork and fat laced rashers were intensly smokey, slighty sweet with a wallop of salty umami flavours. 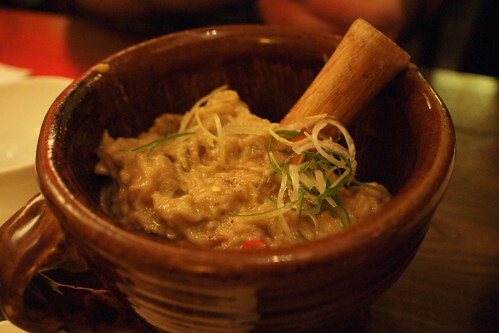 Dried radish for texture and a sauce to bring it all together. This hit my taste receptors like comet from Mars, teeming with strange and alien things. And wonderful for it. 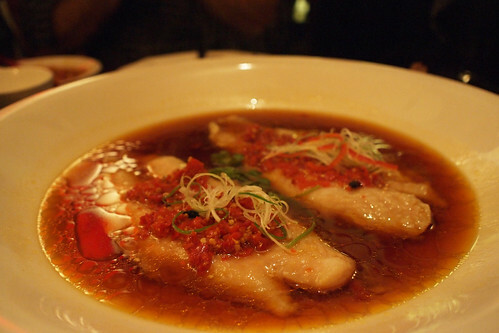 An enourmous bowl of poached catfish fillets came in a shimmering warm and deeply orange broth and covered in salted chillies. The fish, while delicate in flavour still managed to stand eat with chop sticks, but with enough slippery texture to get your teeth into. Peng’s beancurd was slabs of fried tofu slathered in pickled chillies. It was a triumph of texture and taste, with minced pork giving an underlying meaty edge to creamy tofu and those pungently delicious chillies. 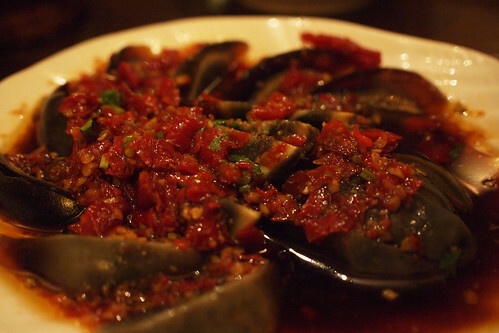 It felt like the Hunanese equivalent of down home cooking, comforting and full of flavour. Everything was very well cooked, and compared favourably with anything else I’ve eaten in a Chinese restaurant in London. Is it authentic? I haven’t got the faintest. But tasty, good value and interesting? Definitely. So for the moment it’s hell yes to Hunanese. 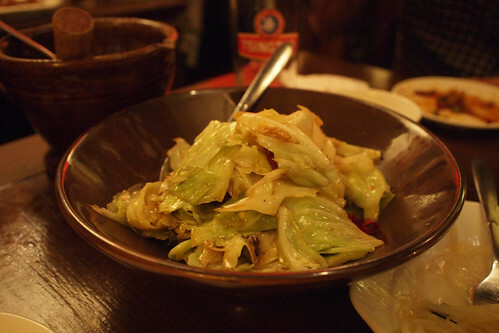 Because at £35 per head with plenty of beer, an unrushed meal was well worth the cost. Do you want some catfish with you chilli? My god it looks good though! That all looks delicious, especially the preserved egg…. and for £35pp with beers thats not bad at all! @Catty – it was, especially the egg. Good value too. One to visit when you’re back maybe? ‘Twas good to catch up especially over such an excellent meal. The only other Hunan joint I’ve been to in London is Golden Day (on Shaftesbury Av) but Ba Shan is much better. 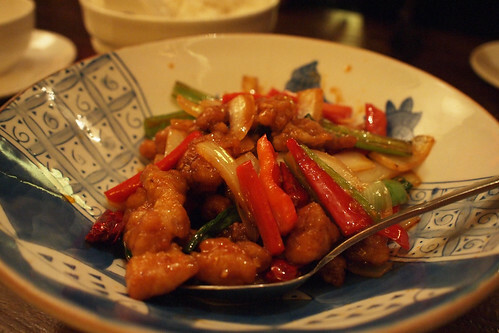 BTW – it’s General Tso’s chicken rather than General Po’s. @Mr Noodles – it was indeed, one of the meals of 2011 so far. Food, service, and above all, company were all good. Also, thanks for the correction – it’s been corrected. When are we going? WHEN ARE WE GOING? The amazing thing is how much good food China has. I suppose it is as big as Europe but in some ways feels more diverse just because I know absolutely sod all about it. There is a pretty good Hunanese place here called, surprisingly, Hunan Garden and you have inspired me to go there for lunch. Though my current addiction is Yunanese spicy noodles. Anywhere to grab those in London? @Tom – it is, and so much of it unknown. Well, unknown to us westerners at any rate. It’s very exciting having just dipped my toe in it, and I am looking forward to finding out more. My comments never come up another try congratulating you on this great review and telling you how much I miss London and that I would kill for Hunanese food right now!